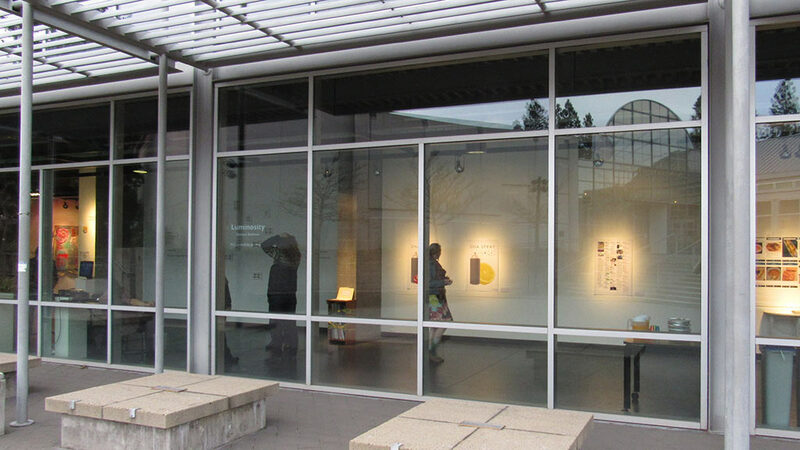 The Center for Visual Arts (CVA) galleries at SOU give students and community artists the opportunity to show their current work. The CVA Galleries are coordinated by a student Gallery Director and Assistants. Exhibition Proposal Applications are currently being accepted for the entire 2017-2018 Academic Year. Applications are accepted for each term on a rolling basis until all slots are filled. The priority deadline for Spring 2019 is March 1, 2019. Individuals with disabilities are encouraged to attend all University sponsored events. If you are a person with a disability who requires accommodation(s) in order to participate in this program, please contact Shawn Foster in Disability Resources at DSS@sou.edu in advance. The Retzlaff Gallery is the typical white cube type gallery with no windows and three blank walls for maximum hanging space. This gallery is perfect for installations and video. It is often reserved for BFA students to present their final body of work before graduating but is also used by the community and student artists depending on availability. The Thorndike Gallery (pictured above) is designated for local and out-of-state artists, as well as student work depending on availability. Abundant wall space on the left (three large walls) and three panels on the right with natural light from the floor to ceiling windows. These galleries may be used for student artwork either in single, group or classroom exhibits. The areas are also used by local schools and selected community groups as an alternative space for their artwork, including: Best of the Best High school competition; art workshops through Extended Campus Programs; Lithia Springs Boys Home; the Empty Bowls Project. The Center for Visual Arts at Southern Oregon University has two classrooms available to rent to university employees and students as well as the general public. Rates are determined based on the admission structure of the event, the type of affiliation with the university and which facility is being requested. Rental requests may only be considered after the prioritization of class scheduling has occurred each term. As these dates fluctuate term to term, contact the OCA Auditorium Manager for more information after you have read this page to answer your basic questions. *The lobby area which includes a seating area and fireplace are available for use with the rental of either facility. The basic rental rate is a per use charge for the use of the Meese Auditorium (AB101) and the lobby, or the Olsrud Classroom (AB124) and the lobby. Rental rates vary depending on an event’s sponsorship and whether admission is charged. Rates are based on a four-hour rental period. Events under four hours are not pro-rated and events over four hours will be assessed extra charges. Rates do not include the use of any SOU equipment or extra personnel that may be required. There is a non-refundable $50 processing fee, which will be applied toward the final rental amount. – Events at which freewill offerings are collected are considered as admission fee events per the State of Oregon. – Extra fees may be assessed for custodial or security services, additional time requested for event, or for events held during usual non-operational hours as deemed necessary by the OCA Auditorium Manager. Co-sponsorship is available to non-SOU, nonprofit groups that can demonstrate affiliation or relationship with an SOU Department or Club. The outside group bears the financial responsibility for the event, but the SOU sponsor agrees to assume responsibility should the outside group default.